Having been thoroughly rained on as I walked into work with my father this morning, the rest of the day has been fabulously sunny. The department was quiet again- perhaps it’s the lull back into teaching after the Easter holidays? Or perhaps it’s just because the desk by the window looks out onto an open space, high up from the vantage of the 5th floor, whereas my previous desk was next to a glass window onto a corridor, so I was continually surrounded by the impression of a lot of people (the office being next to the decent coffee machine, so a lot of people ‘happen’ to drop by). Most of today was spent going through notebooks and typing up bits and snippets to do with Ada and GIL. At some point i’m going to have to sort everything into coherent order- at the moment it’s just paragraphs from all over the place, interspersed with longer scenes and one-line ‘concepts’ or quotes from other sources. I finally got round to sending in my abstract for the CIRCLE mini-symposium in a couple of weeks, where I’ll be making a brief presentation on Prototype (the working title for the Ada and GIL novel) and the other writing I’ve been doing here in Informatics. I also returned library books before they were overdue – a first since I joined the Edinburgh University library. Then I had take-out flourless chocolate cake from Tea at 94 (HAPPY BIRTHDAY CLARE! )- very tasty. I’m working on the assumption that the lack of flour means it also has no calories. 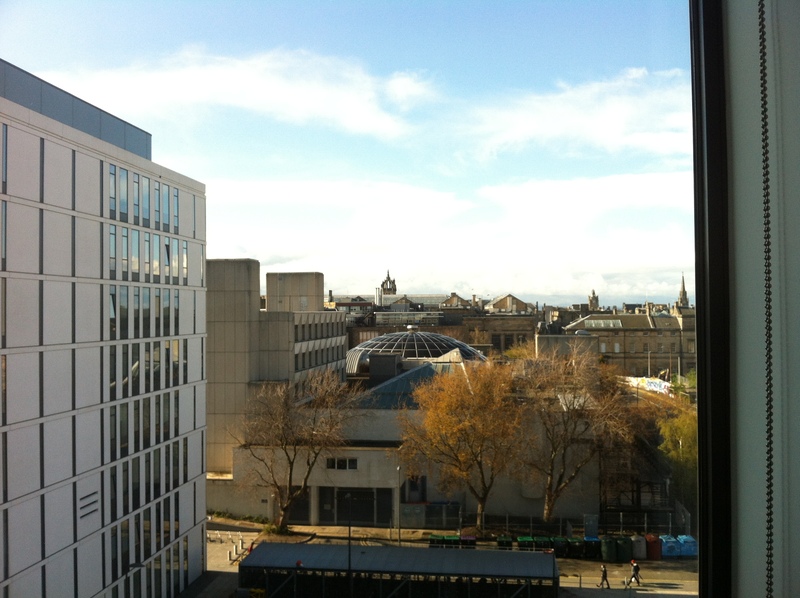 From the office on the 5th floor, GIL shows Ada St Giles. Or, rather, he shows Ada the curved, studded, gilded arches of St Giles that reach up from behind the roof of what Ada thinks must be the National Museum of Scotland. Ada tells him about the buskers who congregate on that part of the Mile, twisting their heels into the divots between the cobblestones and rocking from one foot to another as they sing. ‘No,’ Ada corrects him. ‘They’re from Princes Street most like, the corner by Waverley.’ GIL agrees that sound carries strangely far on the wind, even up the steep wynds and over the wet rooftiles. Ada concedes that the sun does bring the pipers out, even in the Old Town. Ada tries to explain to GIL how it feels to be a local – to be her, shoving though the crowds of teenagers covered in glitter and face-paints on the way home from a long shift. He nodded. ‘I too am a local. We are known for holding strong views abut this.’ He quotes a newspaper article on it from The Scotsman. ‘No.’ Ada puts her palm flat on the desk behind them and steadies herself. ‘That’s reading, not feeling.’ GIL keeps looking out across the rooftops, his face a mask of perfect composure.